Kirsten Bacon is a maverick, true to herself, and in being that, has created some pathways that many female chefs should be grateful for. Looking back at her career, even Kirsten herself is openly amazed at the number of firsts she can count in the industry. 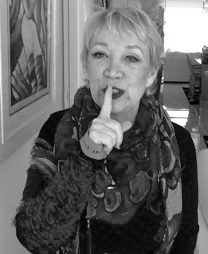 Her students now would do well to look and listen, and I’m sure they do, for there’s massive wisdom in her small frame and busy hands. We’re enjoying a brief brunch at Room for a Pony, in North Hobart, as Kirsten relaxes into a well earned break from training the next generation of hospitality workers at Elizabeth College. As a teacher, I can imagine that Kirsten is a natural: she’s energetic, thinks quickly, and loves the industry that still provides for her and her family. Can we do spun sugar? Yes we can! Room for a Pony is an easy choice for both of us. 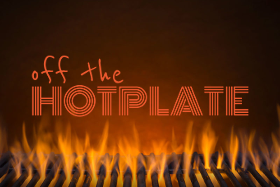 I love their interesting, eclectic food, and the service is always good and personable. It’s a place that opened with a bang and hasn’t looked back. 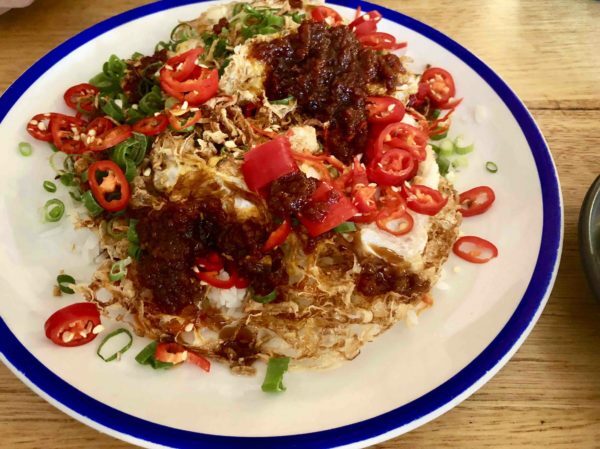 We settle in to an Indonesian style omelette replete with chillies that might test the palate, and I try the sticky black rice pudding with mango that serves me well. Kirsten sits back and sees her past flicker through her brain as she lists her first boss, Gary Dorrington from Sweethearts Café in Hobart’s Trafalgar Square who ushered her in, raw and untrained, to the industry. Working at a christening where she and her sister made some of the cakes she got talking to Fred Pfister who asked her if she was keen on patisserie. After that conversation Fred put her touch withthe Wuttkes who owned a German Konditorei out in Moonah, called Delishus, where she dabbled in Danish pastries and ‘continental cakes’ and pastry cooking became her metiér. Fred was an incredible inspiration for Kirsten, and we then swap stories of Fred and his knowledge of everything pastry. I judged at the Royal Hobart Fine Food Awards for two years with Fred, and he was the kindest, calmest judge of us all. Kirsten remembers that she was the first ever female Baker/Pastry apprentice in Tasmania, and people used to visit that humble shop in Moonah, with divine European delicacies, from all over. 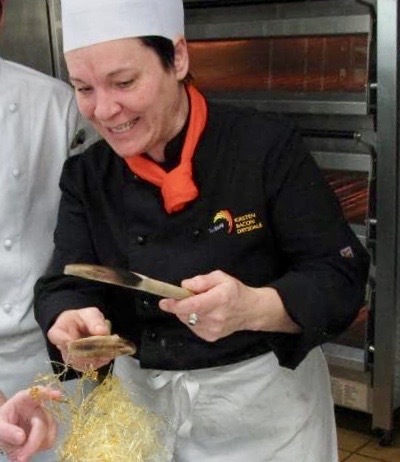 She decided then, after 5 years and qualifying, that she wanted to learn more: general cookery and expand her skill base, so she went back to Drysdale full time for 6 months to do a Certificate 3 in Commercial Cookery. Working at the Taroona Hotel (where the now very accomplished Paul Foreman was an apprentice) and the Richmond Arms gave Kirsten a broader outlook but she was still hungry for more. Queensland sounded good, and floating around Hervey Bay, moonlighting at restaurants Kirsten was offered a job teaching at a College. Already ensconced were a couple of old chef friends from Tassie, and similar to Elizabeth College now, it was a new concept then – a vocational education school. 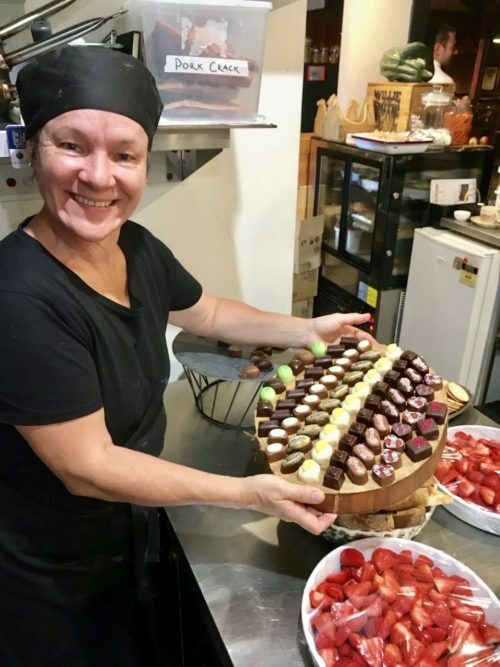 Soon Kirsten found herself training bakery and pastry apprentices at the College of Tourism and Hospitality in Brisbane (COTAH), and another first! The first woman to be appointed to the board of the Bakery Industry Association of Queensland, Kirsten drove some huge improvements into an old and stagnant system. She became involved in moving vocational training into a flexible delivery program, shaping each facility to the needs of the community. 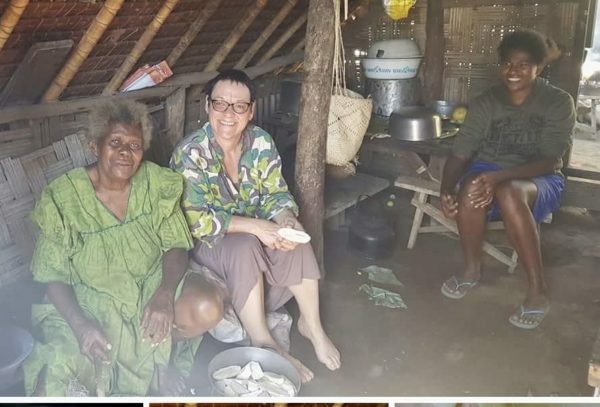 Working out west was a highlight, and working in the village of Munduk in Indonesia as part of an Aus Aid program was an experience she’ll never forget. “The village worked as part of a hospitality training program out of Nusa Dua, Bali, and the kids needed training in all aspects. It was the early 90s, and one of my team always called me ‘Ibu’ or mother, and he proudly showed me that he’d been shopping and bought some things for Front of House. He’d bought 500 ‘message pads’. 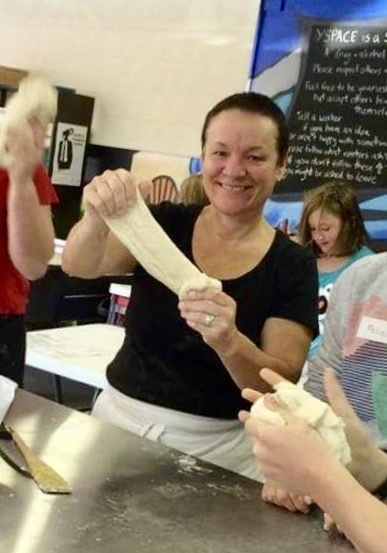 Kirsten returned to Tasmania and began working at Drysdale TAFE in 1999 teaching baking, pastry and commercial cookery, working with prisoners, long term unemployed, and women in trades. A mixed bag and challenging at times, but enormously rewarding at others. 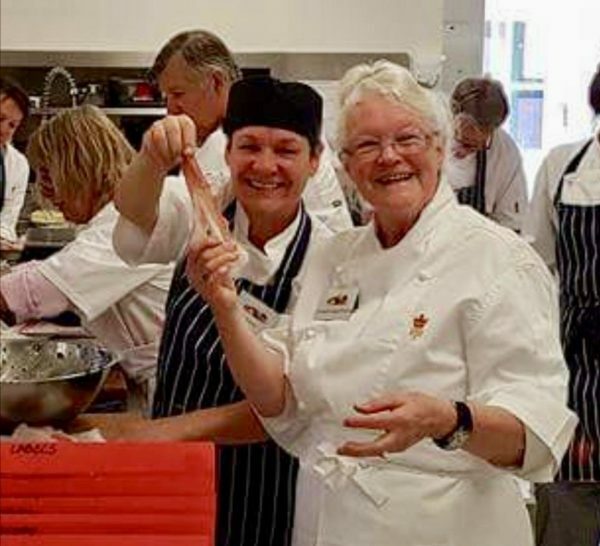 Kirsten now still runs her own catering business,as well as other industry opportunities , an interest to keep her hand in the pot, literally, and after getting her Bachelor of Education in Applied Learning in 2015 began at Elizabeth College. Vocational education is a subject dear to her, and no doubt Kirsten has seen many students benefit from her long and extensive experience and passion for passing on the skills and wisdom. Kirsten just happens to have a twin sister, Ainstie, who is chef at Hobart’s Government House, and she slips in there to help out when needed, as she does also to help her old friend, Paul Foreman in his Black Box Kitchen. (Mucking about in our feature image at the Garlic Festival). All that means is that Kirsten is eternally busy, booked up, and keeping her skills and knowledge as relevant as it’s possible to be. She’s working on collaborations with the stalls at Dark Mofo for her students – where the chefs get help, and the kids get experience, and those all important networks begin. It’s almost time for Kirsten to go back to the college, where a new group of female chefs look set to dominate the industry. So what’s her advice for young kids considering stepping into a big career? Kirsten heads off to another class at Elizabeth College, and the Garlic Festival was coming up where she’s usually working with Paul out of the Black Box Kitchen. While she has a big history behind her, Kirsten is a shining example for girls who want to enter the industry, and I’m sure she is only just getting started.